Tra La La…it’s Delicata Squash time. This is one of my favorite fresh produce seasons, where squash can be found in abundance! 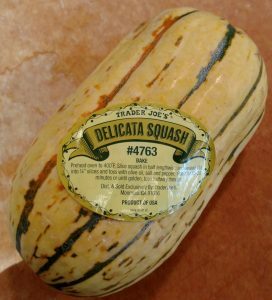 Every year I make sure to take a trip to Trader Joe’s or Whole Foods to get my absolute favorite Delicata Squash. 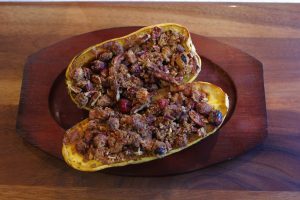 The squash is small and oblong shaped, with a thin edible skin, and a sweet, creamy, incredible inside. You can even roast the seeds with a little sea salt for a bonus snack. I actually heard someone on a facebook group call Delicata squash “crack”. Really. 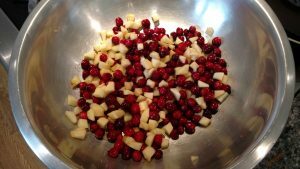 It’s also the time of year when you start to find tangy cranberries, and crispy, juicy, sweet apples. OMG! Now put them all together with brown sugar and crunchy aromatic pecans!!! ‘Nuf said. 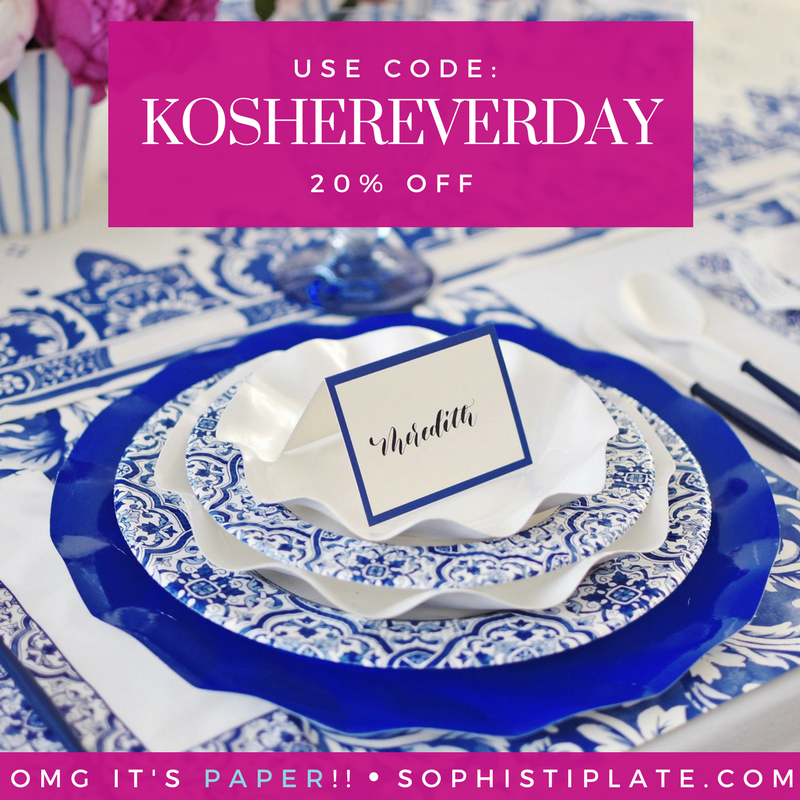 This is also the perfect dish to make for Thanksgiving!!! So add this to your menu and stay tuned for more TG recipes to come!! Ok…so they’ll be better than this….really!!!! Please let me know what Thanksgiving recipes you’d like to see! 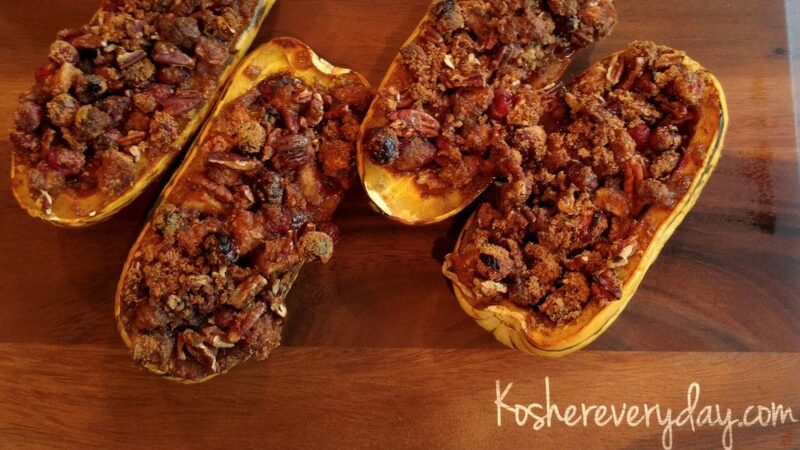 Make sure to check out the Kosher Everyday Pinterest Page for more Thanksgiving ideas! 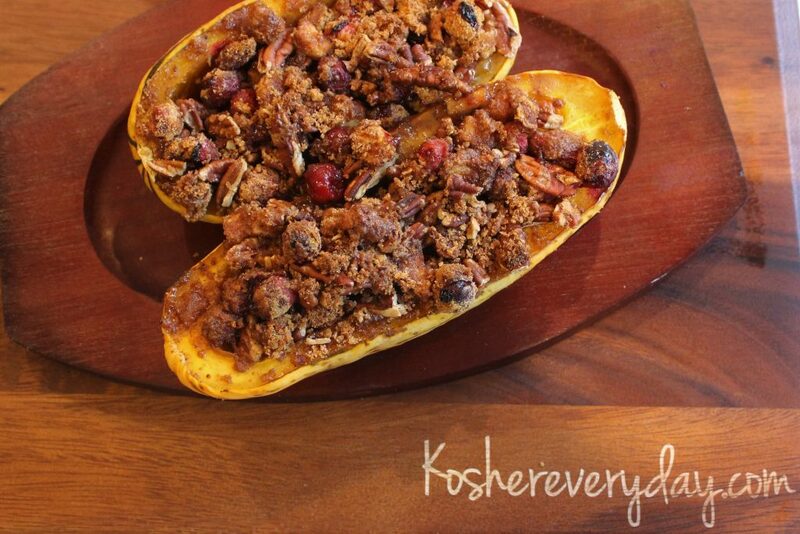 A sweet, crunchy, creamy, tangy, healthy Fall dish! 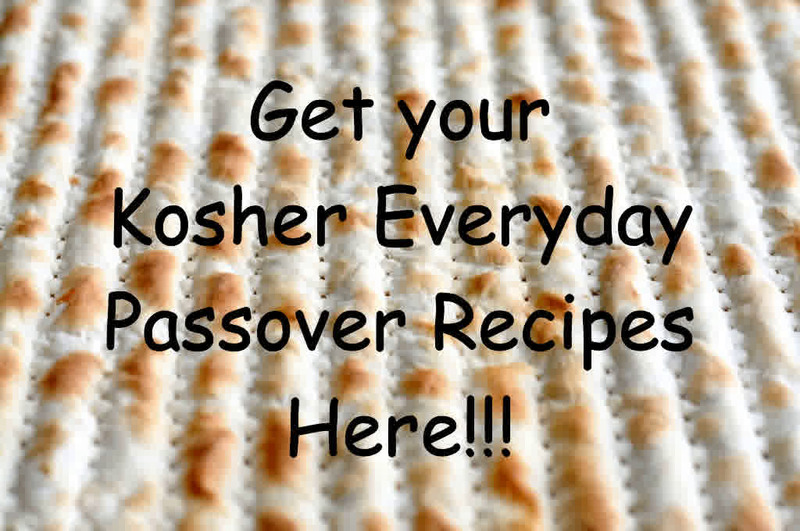 Preheat oven to 350°F bake or 325°F convection. Cover a large rimmed baking sheet with foil. Spray with non-stick spray. Place the halved squash on the baking sheet. Set aside. 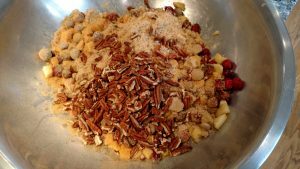 In a large bowl, combine the remaining ingredients except the maple syrup. Stir until completely combined. 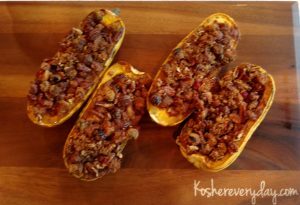 Fill each squash half with filling, until all the filled is used. It is OK if some of the filling ends up on the pan, it will bake and become crunchy and will be delicious to nosh on. 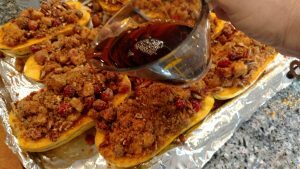 Drizzle the maple syrup evenly over the squash halves. 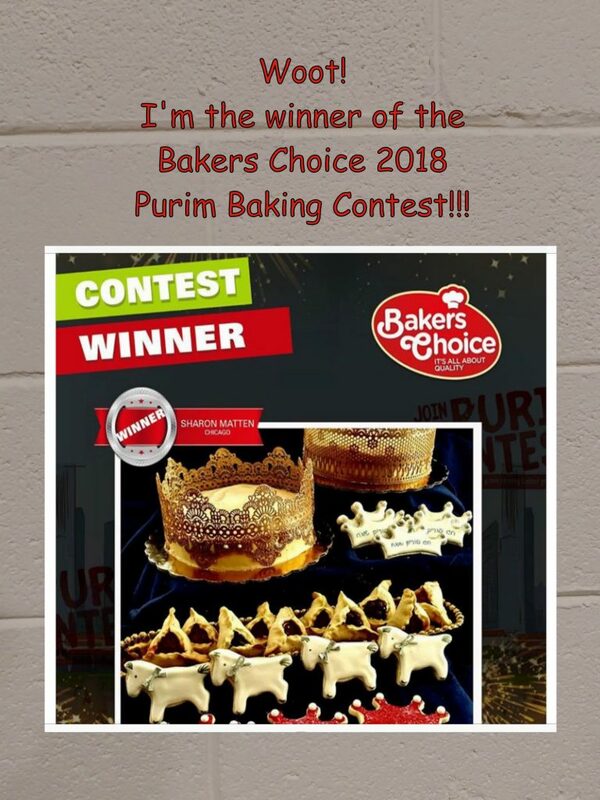 Bake in preheated oven for 60 minutes. Cut squash into halves or thirds, if desired. Serve warm. 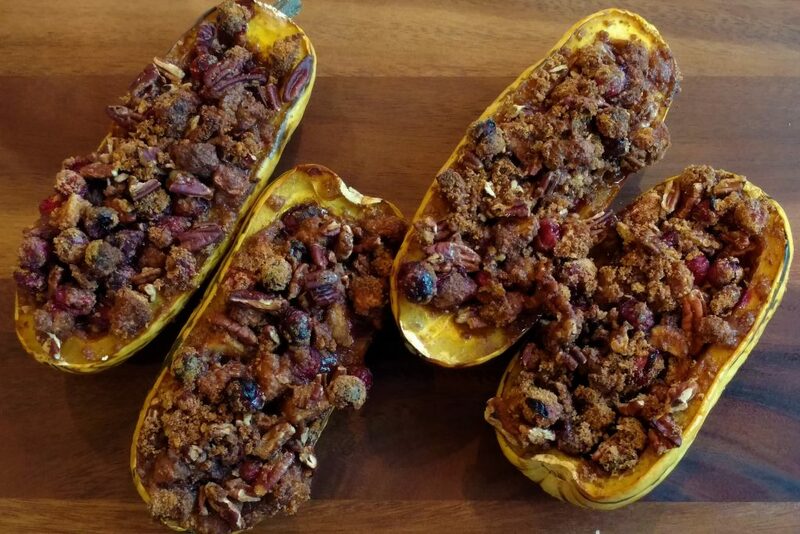 You can substitute your favorite nuts in this recipe if pecans aren't available. 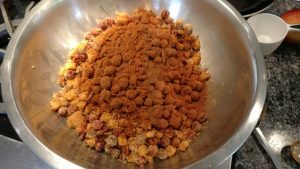 It would also be good with walnuts, almonds or hazelnuts. If you can't find pure maple syrup, you can use pancake syrup. 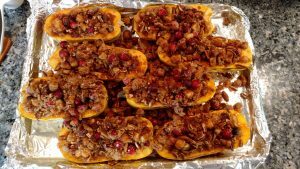 If Delicata squash aren't available in your area (sad face) you can use butternut or acorn squash. 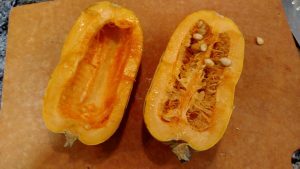 Start by scooping out the squash seeds. You can save and roast them! 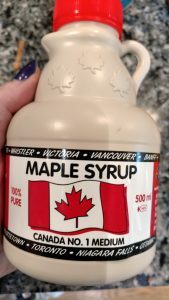 It’s best to use pure Maple Syrup that your friend Beryl brought you from Canadia! Thanks Beryl!!! 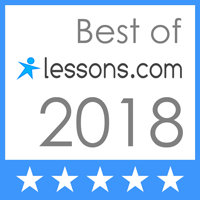 That’s all folks…let me know what you think! 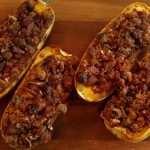 How do YOU prepare your Delicata Squash??? Wonderful recipe. Because I need portion control, i pre-sliced squash and put into individual ramekins with stuffing on top. Yum….. Had a hard time storing them away; could have finished the whole thing. Miriam, I’m SO proud of you! There have been many times when I haven’t demonstrated your self control lol. I’m sure people appreciate the suggestion! Keep them coming!